Stalking and harassment are, sadly, part and parcel of running a moderately successful blog. Sometimes you publish something that others would rather you did not. The more creepy and obsessive register their dissent in ways that are designed to make the blogger keep quiet, or at least think long and hard before revisiting the subject that has caused the dissent. This can be done in a number of ways: publishing smears in retaliation is one, but this merely draws attention. Much better is to tell the blogger that you know where they live, you have their phone number on speed-dial. Sadly for one such exponent of harassment, their crude attempt to silence me is about to be shown up as nothing more than laughably amateurish idiocy. Do you recognise this handwriting? Who is behind what I publish today I do not know: that is part of the reason for publishing. Any information as to the identity of the author will be treated in confidence, and can be passed by email to the address at right. So what is involved? 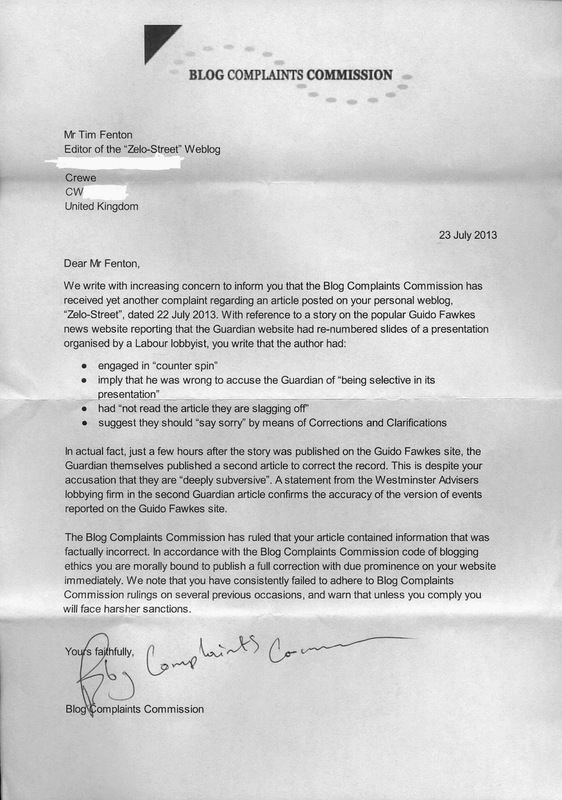 There has been a series of letters from the “Blog Complaints Commission”, a body that exists only in someone’s imagination, and a lousy bit of Photoshopping. 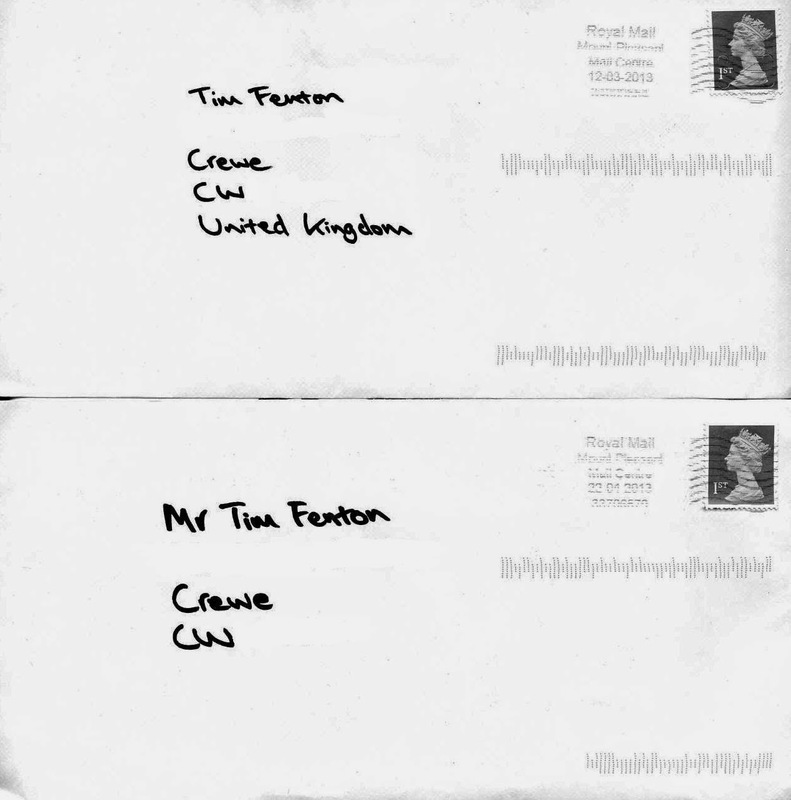 The envelopes used for the first two letters were addressed by hand, using a black felt pen with a thin tip. The handwriting appears to be that of the same person. Both envelopes were given the luxury of a first class stamp, and both were postmarked “Mount Pleasant Mail Centre” [central London]. A later letter arrived in a franked envelope postmarked “London EC1”, and from a machine numbered PB338929. Second letter - does the style look familiar? All the letters you can see here took exception to Zelo Street posts on the activities of the perpetually thirsty Paul Staines and his rabble at the Guido Fawkes blog. 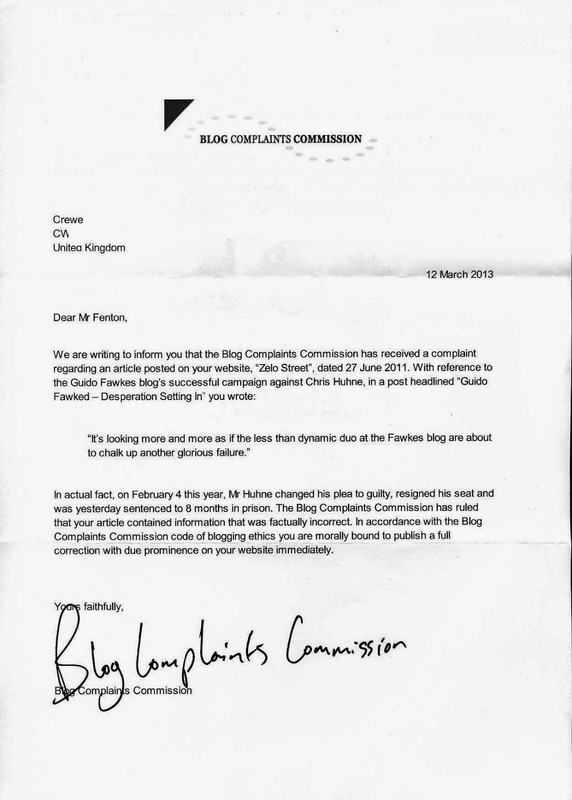 Both claimed that complaints had been received by the mythical “Blog Complaints Commission”, and that there was some duty on me to publish some form of correction. The tone became progressively more threatening. 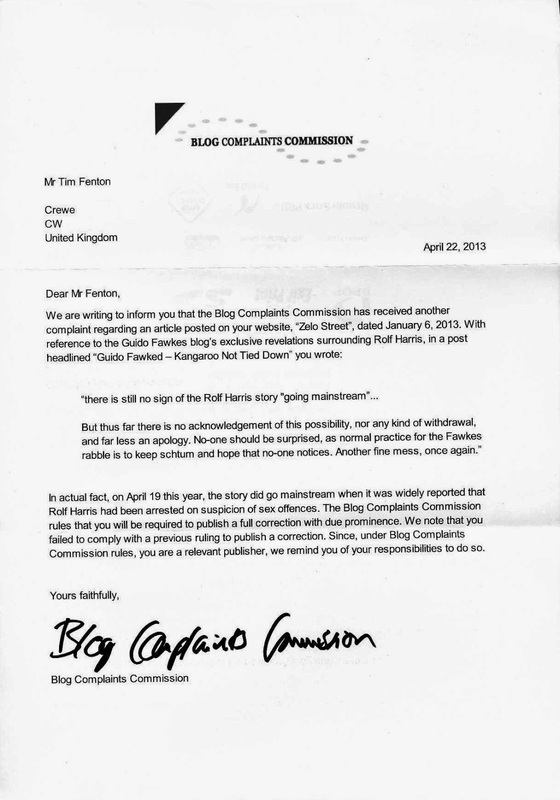 Indeed, the third letter concluded “We note that you have consistently failed to adhere to Blog Complaints Commission rulings on several previous occasions, and warn that unless you comply you will face harsher sanctions”. Even allowing for the unintentional hilarity, that is a direct threat. Someone knows where you live, and they are going to do something harsh if you don’t leave off The Great Guido. Now, the Fawkes rabble may have nothing to do with this ridiculous attempt to silence one of their critics. But, whoever is sending the letters, this is stalking and harassment. And it’s bang out of order. Do you recognise the handwriting? Does the franking machine ID ring a bell? All information gratefully received. PB338929. I'd put £5 on it being a Pitney Bowes machine. Blimey if this person is serious about errors in postings/articles he/she must have a seriously large post bill if he/she have taken the same action with the Dail Mail (MoS) and the rest of the tabloid press. Perhaps they may be able to help from inquiring into their post bag(s)? Any particular reason for floating this now rather than a year ago when the letters were (apparently) sent? Can't go into that right now - sorry. It's definitely a Pitney Bowes machine - the company either rents it from them or has a contract to buy top up postage from PB. Send all the info over to these, as well as the police. surely there's a question you've not asked - assuming you don't publish your full address on Twitter - how did this nutter get hold of it? Someone who actually knows you? Or did money change hands? Or good old fashioned hacking? Is there a chance of a second offence on top of the harassment charge? And Captchas first word for this post is mischief - must be an omen! 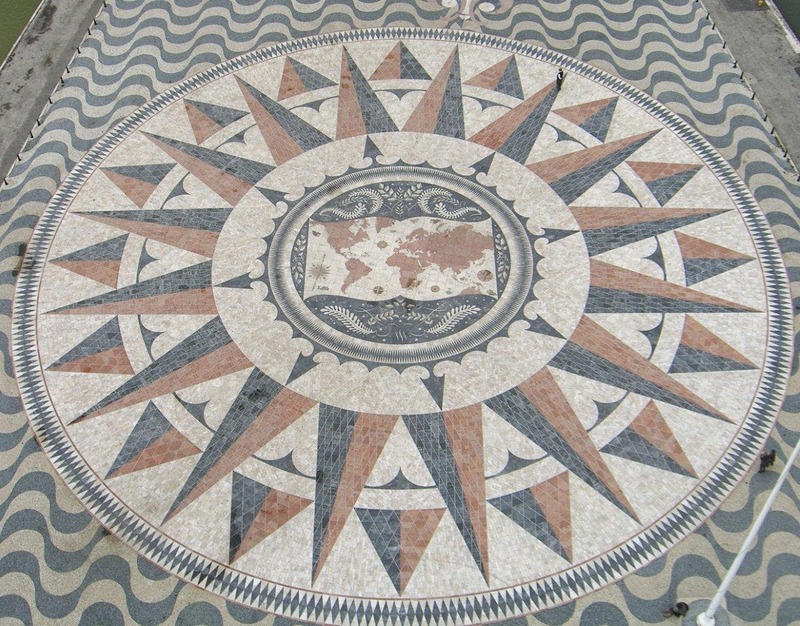 Telegraph Blogs – What Future Now?